In order to develop a quality or skill it must be distilled to behaviors. I was fascinated when a client pushed me beyond behaviors by saying, “Curiosity is an emotion.” This post is the result of her statement. Curiosity makes you interesting. The most boring people aren’t curious. 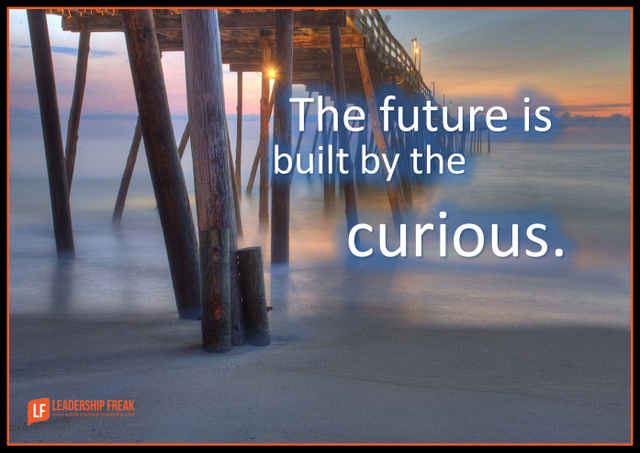 The future is built by the curious. People who make statements without asking questions are arrogant, boring, and eventually irrelevant. Inquisition. Guard against putting people on the hot seat with too many questions. Scepticism. One sided conversations make others feel sceptical of your motivations. Control. Questions can be controlling. Leading questions make people feel manipulated, for example. Calmness. The number one emotion of curiosity is calm. Hot emotion reveals an agenda driven conversation. The hotter you are the more you’re advocating or defending a position. Compassion. Giving space to curiosity feels like compassion for another. It says they matter. Patience. Curiosity takes time. People don’t always know what they think, especially when questions are probing. Tolerance. Uncertainty is tolerable for short-periods of time. Curious leaders refuse to latch on to first answers. Confidence. It takes courage to “not know” and give yourself space for the light to come on. Trust. Curiosity trusts itself. You may not know where the journey ends, but it’s worth the effort. The skill of curiosity is asking questions and attending to answers. A question you can’t answer is a thing of beauty. Declaration. Declare intentions and motivations. Revelation. Reveal some of yourself. Maintain the equilibrium of power. Delay. Don’t make up your mind quickly. Pretend you don’t know. I’m delighted to partner with Clarity Development Consulting to offer the proven “Coaching for Engagement” program. Drop me an email if you’d like to explore having Bob Hancox and me come to your organization to develop the coaching skills of your team. Absolutely. And it makes the whole world more interesting. Step back from the wagon and take a different look at your current reality and see if you might find a thing or two to change; then decide what you would like to do differently. Overcome that fear and step into something slightly new and slightly different. Have fun out there, too! I see curiosity in its purest form through the eyes and behavior of my 2-year old nephew. From this perspective, curiosity is a state of full engagement, full openness, and full being. The engagement is authentic and full of wonder. The behavior is natural and in search of a deeper understanding. Curiosity is the quintessential characteristic for an ideal learner. Learning is a very important component to creativity which in turn is a very important component to innovation. Curiosity is also as much about objects and concepts as it is about people. I don’t know that I would call curiosity an emotion – I think you can experience different emotions when you are on a journey fueled by curiosity. I do think curiosity is a way of being, a way that any person can choose to interact with the world around them and with the people, objects, and ideas that they come into contact with each day. leadership asset we all possess that is not especially gifted or clever: It is simply curious. Curiosity plus a desire to improve the status quo drives innovation. Thus, motivation plays a key role. Innovators apply divergent thinking to create liberating and productive conversations. Skeptics hijack curiosity with convergent questions to obstruct and confine progress. Flee the obstructionists. And I agree: Non-curious people are boring. Once again, Dan, thanks for a great topic today. I believe the ‘Curiosity Skills’ include being present to absorb what is being said, choosing to be open and non-judging when listening and asking open questions to which one does not know the answer. We need to be really present to someone, listen AND ask open questions to be in a place where we can be curious. I struggle with the notion that curiosity is an emotion. I do believe there is a connection with emotions – neuroscience has discovered that when we are curious with another, dopamine is released which makes us feel good and as we continue to be curious dopamine and oxytocin are released which help us collaborate with others. We have found when we begin to feel emotional in a conversation (let’s say angry), if we begin to be curious, the emotion washes away because of the release of dopamine so we are able to stay in the conversation, remain calm and curious so we can seek to understand the person(s) we are talking with and try to find common ground to move forward. This means we no longer have to avoid challenging conversations if we can remain curious. Having said this, a client yesterday, shared that she believes curiosity requires courage and can lead to a feeling of vulnerability which could be seen as shame which is an emotion. If we don’t know the answer to a question we ask at work, we could be perceived as being stupid, not informed and thus it takes courage to ask the question and leaves us feeling vulnerable. Rex – my daughter and I have founded the Institute of Curiosity and have published a book on curiosity so if you are interested in exploring curiosity, give us a shout. hello kathy, i totally loved the points that u explained. I am an architecture student and i am doing my thesis on curiosity in architecture for play of mind in the space given. if you could tell me your views about it, it would be greaat. Also, tell me about your Institute of curiosity and the book on curiosity. i would love to read it. Hi Pratiksha: Your approach to space as an architectural student is fascinating and I would be fascinated to talk to you about our thoughts on curiosity. Our focus on curiosity is from the perspective of building effective relationships, where we seek to really understand each other. I am co-author of the book with my daughter (also co-founders of the Institute of Curiosity). The title is: The Power of Curiosity: How to Have Real Conversations that Create Collaboration, Innovation and Understanding. It is available on amazon and many bookstores. Please contact me at kathy@instituteofcuriosity.com and we can arrange to chat. Thanks so much for reaching out to me. I’ve been enamored by this idea for many years – that curiosity is a skill (or more like a superpower), and that it drives action. And if action is what we need to accomplish our goals in life, then maybe curiosity could be a driver for any change we want to make. But we have to be what I call ‘curious enough’ to act. I even started a web site about it at http://areyoucuriousenough.com and currently writing a book. Just like any superpower, it can be used for good or evil. Bad curiosity leads us down paths that are unproductive or downright destructive, if you’re curious about using drugs for example. There are so many aspects to curiosity that are super interesting to me. Thanks for bringing it up here, Dan. Anything that drives action has some serious power, and therefore requires study. It completely drives kids through their whole development. When did we lose it? I’m curious – why isn’t there a photo accompanying today’s message? Nice write up on the all important trait of curiosity. I’m currently working on trying to instill a sense of curiosity in my young kids. It is so important and I agree, must be from a neutral perspective without an agenda. Dan, I’d add: don’t settle for the first explanation that you arrive at. Search for another way to explain. And another. And another. Only then you can translate curiosity into true understanding.